The second in the Circle C Milestones series Andrea Carter can ride, rope, and cut out cattle with the best of her brothers' ranch hands. Yet, her mother has always held the family's youngest daughter back from fully participating in ranch activities. With the approach of her fifteenth birthday, even the ranch boss, big brother Chad, can't deny that his baby sister is better at ranch skills than some of his cowhands. When Andi announces that her "quinceanera" birthday wish is to join the upcoming cattle drive, her family is stunned. But after further discussion and multiple newspaper clippings about spirited women who balked at society's expectations, even Mother agrees that the only way to get this cattle-drive notion out of Andi's head is by letting her and her cousin Levi go along as Cook's helpers. Andi is elated. What can go wrong on a two-week drive to Los Angeles? Andi quickly discovers that a cattle drive is a dirty, dangerous business with little sleep and the same food day after day. Between late nights, dust, mosquitos, and an abrasive cowhand trying to win Andi's attention, it is definitely "not" a holiday. Andi grimly determines she will stick it out. When a river crossing goes wrong and Chad is shot in a gunfight with suspicious men who have been shadowing the herd, Mitch the trail boss finds himself dangerously shorthanded. Andi and Levi can no longer just give Cook a hand. It's time to pitch in and help Mitch get their cattle to market--any way they can. 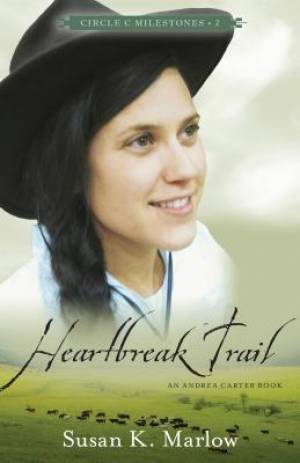 Heartbreak Trail by Susan K Marlow was published by Kregel Publications,U.S. in July 2015 and is our 66930th best seller. The ISBN for Heartbreak Trail is 9780825443688. Be the first to review Heartbreak Trail! Got a question? No problem! Just click here to ask us about Heartbreak Trail.